George III was one of the longest reigning British monarchs, ruling over most of the English speaking world from 1760 to 1820. Despite his longevity, George’s reign was one of turmoil. Britain lost its colonies in the War of American Independence and the European political system changed dramatically in the wake of the French Revolution. Closer to home, problems with the King’s health led to a constitutional crisis. 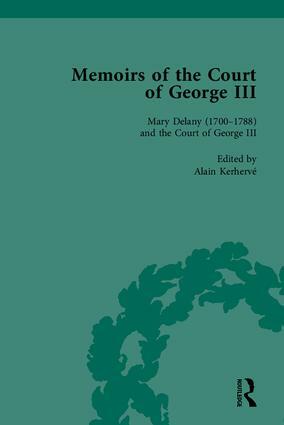 Charlotte Papendiek’s memoirs cover the first thirty years of George III’s reign, while Mary Delany’s letters provide a vivid portrait of her years at Windsor. Lucy Kennedy was another long-serving member of court whose previously unpublished diary provides a great deal of new detail about the King’s illness. Finally, the Queen herself provides further insights in the only two extant volumes of her diaries, published here for the first time. The edition will be invaluable to scholars of Georgian England as well as those researching the French and American Revolutions and the history and politics of the Regency period more widely. "The text of each volume is very thoroughly annotated, to a high level of accuracy. The overwhelming majority of persons, including servants and tradespeople, are clearly identified…These editions will undoubtedly be of service to historians." "(…) this is a handsome set which makes more available a wealth of information illuminating the rhythms of court life in the period together with insights on dress, gender, music and theatre, as well as both court and parliamentary politics."